Welcome brethren to this sacred place. 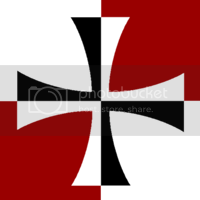 Gathered here are the names of all crusades past and present, recorded and presented to provide inspiration and guidance for all true sons of Sigismund. So set down your blade and wargear and bask in the glorious deeds of our proud chapter. 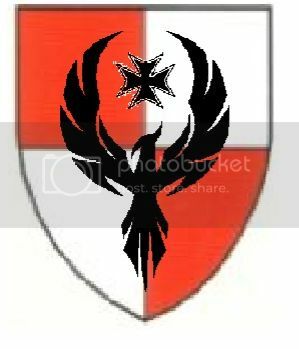 Led by Marshal Recard, the 18th Crusade is currently operating on the eastern fringes of Imperial space and pursuing a campaign against the encroaching Tau Empire. The Golgotha Crusade, led by Marshal Godfried is en route to liberate the Ork held world of Golgotha, working in close concert with the Golgothan 7th Legion Imperial Guard. According to various reports they've encountered Tyranids, Orks and even some daemons. 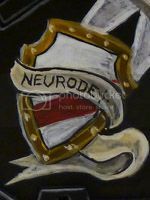 At present, the Neurode crusade's forces are divided. While a pursuit force lead by Marshall Arthur and an accompanying Inquisitor is after a traitor governor who left the Neurode forge world in ruin, the bulk of the Crusade rebuilds its strength in a newly established chapter keep after sustaining considerable loses in a series of violent war campaigns. Deployed to the Halo Stars, on he far side of the Eye of Terror, Marshal Marius von Falkner has answered the call for aide of an industrial world trapped between a waking Necron threat, and an encroaching Ork horde. Currently mustering its forces in the Rikia system, the Laurentia Crusade is preparing to purge subsector Laurentia of the chaos forces emerging from the nearby Maelstrom. Forces from the Ordo Malleus and the Radiant Light space marine chapter have recently also joined the effort as momentum is building behind the crusade. Led by Marshal Lerrick, the Purgatis Crusade is now set out on a planetary campaign against an alliance of Xenos and an Alliance of Chaos. Taking in the assistance of an Inquisitor Malleus, the crusade is ready to purge the region of any threat to the Imperium of Man. Formerly partnered with the Black Angels, an elite squadron of assault marines who specialize in routing traitorous imperials, the majority of the Crusade has taken a break to address this more urgent matter. Tags: Painting, Battle Reports, Storylines, ZEAL! In the Jericho Reach the Achilis Crusade has faltered. The High Marshal believes that the Imperial commanders in charge of the crusade are incompetent anad have squandered the resources the Black Templars have sent them. But the Reach is an important sector with Imperial worlds who have stayed true throughout the long centuries of isolation. Thus he has tasked Marshal Ramius with leading a new crusade into the Reach, a Templar Crusade, to eradicate the xenos and chaos filth from the region. Currently following a lead regarding a big Xeno fleet that might be a serious threat to the worlds on imperial border. Inquisitor Alexander Shulginas is (seemingly) helping the crusade track the enemy fleet. The crusade is led by Marshal Albert Manhoff. Under the commands of the High Marshall Zythius, the 21st Redemption Crusade's battle forces are spreading the Light of the Emperor accross the Galaxy. The unusual fighting style of the Crusade intrigued the Inquisition and the Reclusiam. Especially the presence of two Female Marshal in the ranks of the High Consul of the 21st Redemption Crusade. In the wake of Marshal Helbrecht's ascension to High Marshal, he would place the responsibility of his vow to rid the galaxy of the Storm Lord Imotekh, to Marshal Adonis. The Marshal was no stranger to the both the High Marshals vow and hatred toward the vile Xeno, having been present for both the slaughter of Schrodinger VII and the destruction of the Storm Lords flagship as a member of the Marshals Sword Brethren. Marshal Adonis was given explicit orders, to rid the galaxy of the Storm Lord by any and all means necessary. Led by Marshall Breton, The Mortis crusade are pushing deep into the Mortis Cluster, a large section of space cut off from the wider Imperium since the days of the great scouring. In this cluster they are encountering everything from xenos filth, and loyal servants of the Imperium rejoicing to be reunited with the Emperors light, to foul traitors and heretic filth. All who oppose the noble Templars shall be purged with rightous fury in the name of Sigismund and The Emperor. Marshall Dolourus leads a Crusade to purge the Necron from Polaris V. The stripe represents Marshall Dolourus, the Cross represents Templar Forces and the Skull represents the Imperial Guard already on the ground fighting the Necron threat. 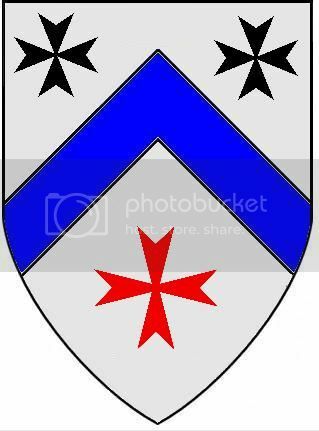 Yes it is a great honour to added to a Crusade Shield, but Marshall Dolourus declared the skull added as a mark of respect for the valour and grim determination shown by the I.G. fighting a foe that, in the Marshalls eyes, is immeasurably superior. Now recovering from decades as the 'Lost' Crusade, after they vanished into a warp storm pursuing Dark Eldar pirates, this troubled crusade is currently establishing Keeps and recruiting new Neophytes. Originally formed during the Third War for Armageddon, this crusade benefits from the wisdom of an experienced high command but has not yet elected a Marshal to lead them in their regeneration. 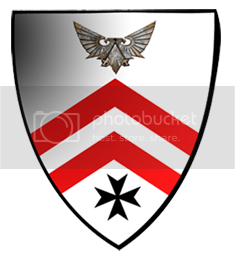 They have, however, adopted the Phoenix as their new crusade badge, symbolising both their rebirth and the burning wrath they deliver in rapid strikes against their foes. Tags: Fluff, WIP, Battle Reports, Righteous Zeal, General Abhorrence of Witch-folk. Edited by DasPanzerIstUber, 18 May 2014 - 05:45 AM. Added Dolourus and Renascibilitas Crusades. Marshal Recard of the Black Templars 18th Crusade. "...This is vital in that when all else fails, it is faith that will carry him through to victory. 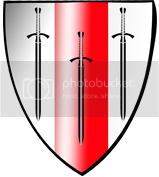 Warriors of faith never shirk from combat but rush forward with heads down and shields up, allowing their glory to carry them into the thick of battle to deliver the first blow." Edited by DasPanzerIstUber, 07 April 2014 - 09:15 AM. 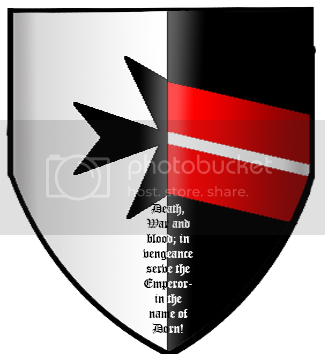 EDIT: Crusade badge courtesy of Roujakis! The Golgotha Crusade, led by Marshal Godfried is en route to liberate the Ork held world of Golgotha, working in close concert with the Golgothan 7th Legion Imperial Guard. According to various reports they've encoutered Tyranids, Orks and even some daemons. Tags: Painting, modelling, the occasional battlereport, huge games. Edited by Andhil, 10 March 2014 - 04:38 PM. "also ZEAL, because a day without ZEAL, is like a day without sunshine." I'm useless when it comes to graphics software, so I've posted my free-hand 'badge' for now. Maybe I'll find someone who'll is more able with photoshops and what-not, and could spare a couple of minutes to redo that. Description: Hell bent on avenging his master's demise at the hands of a rogue Inquisitor, Marshal Godhelm of the Vengeance Crusade will pursue this hated foe from the Chaotic Segmentum Pacificus to the far reaches of the Eastern Fringe... how far will he go to seek Vengeance? Edited by Marshal_Roujakis, 16 September 2014 - 11:53 PM. Brother Christopher, I'm no graphic artist, but I'm pretty handy with photoshop. I'll see what I can do for ya. Edited by Brother Icculus, 11 March 2014 - 08:38 PM. "What's the use of a weapon if you can't cut a person in half with it?" Currently following a lead regarding a big Xeno fleet that might be a serious threat to the worlds on imperial border. Inquisitor Alexander Shulginas is (seemingly) helping the crusade track the enemy fleet. 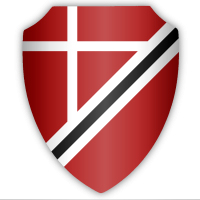 The crusade is led by marshall Albert Manhoff. I'd like to add my Crusade to the list. No Pity ! No Remorse ! No Fear ! Oops missed them sorry. Will handle tomorrow. So while I no longer use the SM Codex, my entire army is still very much Templar in spirit and look, so I thought/hoped I might still qualify to be listed? Edited by Dono1979, 07 April 2014 - 02:00 AM. Edited by mytimeprez, 09 April 2014 - 01:18 PM. Edited by Acebaur, 09 April 2014 - 07:29 PM. Edited by HLVW, 18 April 2014 - 03:34 AM. 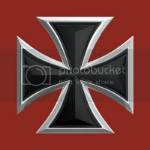 To the Nemesis Crusade - issuing Crusade Badges... please distribute to your Battle-Brothers and Crusade on in the name of the Golden Throne. For Sigismund! Dorn! and the Emperor! Edited by Marshal_Roujakis, 18 April 2014 - 02:52 AM. Thank you very much Marshal Roujakis, much Appreciated. Edited by Gaius Maximus, 21 April 2014 - 10:14 AM. I'm back, haven't forgotten you guys! I've been crusading against the flu for the last week. I'll get the new ones done late tomorrow.